Are you looking for a high-quality, immersive gaming monitor? We’ve carried out extensive research and narrowed down our search to the top five gaming monitors that you can get right now. However, we have made sure to create this review list by sticking to a few guidelines. For one, the monitors here are affordable, not cheap. With monitors, a higher price usually means better quality, but we’ve managed to get a good mix of both here. We were impressed by a lot of the technological features they have to offer. These monitors really can help you take your gaming to the next level. However, they’re also excellent for watching TV and movies too. If you’re interested to learn more about this awesome gaming monitors, take a look below. This 24” ASUS monitor has been made for gaming. There’s incredibly fast response time of just 1ms and a refresh rate of 75Hz. You’re able to experience visuals in their highest quality form with the HDMI inputs that generate very small amounts of lag. We loved the ASUS Eye Care tech that’s built-in to this monitor. This makes it the perfect monitor if you’re strapping in for long gaming periods. Usually, the blue light emitted from monitors can harm the eyes, cause sleep issues, and headaches. However, this ASUS monitor uses a low blue light feature that lets you choose the best settings for your environment. Furthermore, the Flicker Free tech also reduces eyestrain by minimizing any flickering. You can also set this monitor up easily by using the ergonomic stand. It comes fully equipped with swivel, pivot and height features that can all be adjusted. Those of you looking to game for long hours will benefit the most from this monitor. The Flicker Free and Eye Care tech means less strain on your eyes. So, you can game for longer and experience full HD visuals with incredibly responsive gameplay. 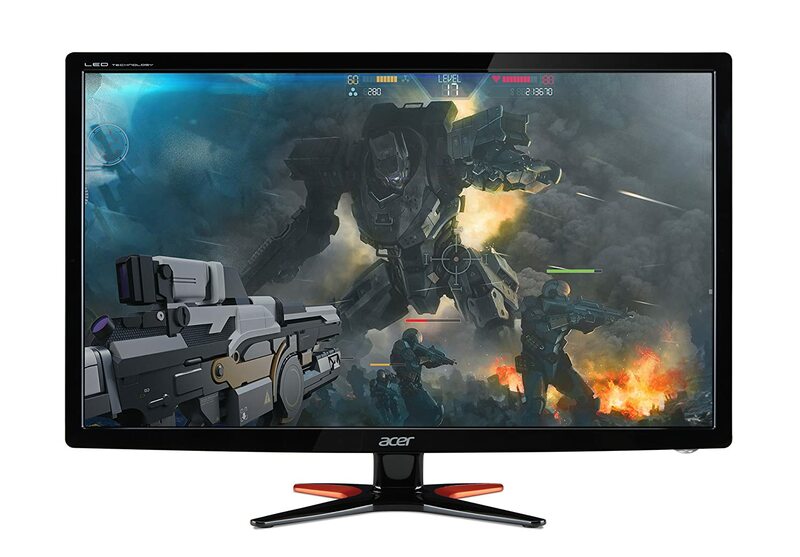 This Acer monitor is 24” large and lets you view and play games in 1920 x 1080 full HD. The AMD FreeSync feature means that the frame rate of each game you play works by the graphic card, rather than the rate at which the monitor refreshes. This is a huge benefit as it means that frames you see on the monitor are linked with the frames on the graphic card which creates an incredible gaming experience. The smoothness is also helped even further by the 1ms response time. With an anti-flicker feature, you can view the monitor in complete comfort. The EyeProtect tech built-in decreases the strain on your eyes and reduces the amount of blue light being emitted from the screen. This light is associated with causing serious eye damage in the long-run. We also appreciated how the stand has been ergonomically designed. It can tilt in a variety of angles and can be adjusted vertically to suit your needs best. For an incredibly smooth and fully HD gaming experience, this Acer gaming monitor may be exactly what you’ve been looking for. The smoothness is unparalleled and the EyeProtect features let you safely enjoy hours of gameplay. This Samsung gaming monitor comes with an Eye Saver mode. When you turn this mode on, it helps to minimise any of the discomfort usually associated with staring at a screen for too long. The strain is caused by the blue light being emitted, but you can reduce by clicking one button. We liked how there are different modes you can choose from. Aside from the Eye Saver one, there’s also a Game Mode. When you turn it on, the contrast and colors are altered slightly to be more appropriate for gaming rather than just watching. The video response time is super quick which means you’re gaming experienced will be on point. It’s also another one of the energy-saving monitors in this review. By switching to the Auto Setting, the amount of energy being used up is reduced by approximately 10%. You can also select an Eco-Saving Plus setting that lowers screen brightness to help with using less energy. We found this Samsung monitor to be awesome for watching movies and gaming without the concern of poor eye health. The various modes available are great for saving energy and going into gaming mode too. With a 1ms response time, you can be assured in playing games without any lag. The colour enhancing tech built-in to this monitor is fantastic. It lets you see better in darker environments, however, it doesn’t cause overexposure issues. The ZeoFlicker and Low Blue Light features work to minimise any eye strain and fatigue. This means you can keep your eyes on the screen for longer without as much discomfort. We liked how this monitor was designed to be resistant to glare problems. You can view it at any angle and avoid glare and reflections. Furthermore, the monitor can be adjusted to your preferences. It can be VESA mounted and tilted to your needs. Lastly, there are also speakers and a headphone jack for enhanced gaming and viewing experiences. This monitor lets you play games with quick response times and prevents your eyes from being strained. It’s also glare/reflection-resistant, meaning you can look at the screen from any angle with no issues. This benefit is helped by the tilting feature too! This Acer gaming monitor is 24” large and provides a stunning resolution of 1920 x 1080. As a result, you get to see all the details which is awesome for gaming with widescreen HD screens. You get an incredible refresh rate of 144Hz for an improved gaming experience. Plugging in smartphones and tablets to experience other devices through the HD display is super easy with the HDMI and DVI ports. There’s no set-up needed, simply plug and play. There’s an impressive ratio of 100 million:1 contrast. This means that you get to see the blacks in their deepest form, and the whites at their brightest. Therefore, viewing anything is completely clear and smooth. The NVIDIA 3D light boost tech means you can also see images with a lot more depth – 3D glasses are provided. We also found this Acer display to be energy efficient. It gives you tons of viewing and gaming benefits, while running on the Acer EcoDisplay. You can game harder and save more energy! If you want an affordable and energy efficient way to experience 3-dimensional viewing, this Acer monitor may be for you. The deeper blacks and brighter whites create incredibly sharp images which are particularly great when watching the films. Although, the 1ms response time makes gaming awesome too. The amount of technology available with monitors nowadays is incredible. Not only do you get to view moving images in crystal clear, full HD quality – you also get to game with super-fast response times. You don’t have to worry about lag or frame rates from the monitor dropping off. With one of the monitors in our review, you can even watch it in 3D! Before committing to making a final choice, make sure to take everything into consideration. This includes what you’re going to primarily be using the monitor for, your budget, and current set-up. For example, if you know you’ll be sitting at a slight angle rather than facing the monitor straight, picking one with angle-adjustment capabilities would be a better choice. If you were considering purchasing a gaming monitor, we hope our review has given you all the information you need to make the best decision possible.